Updated, 6:50 p.m.: Information added. 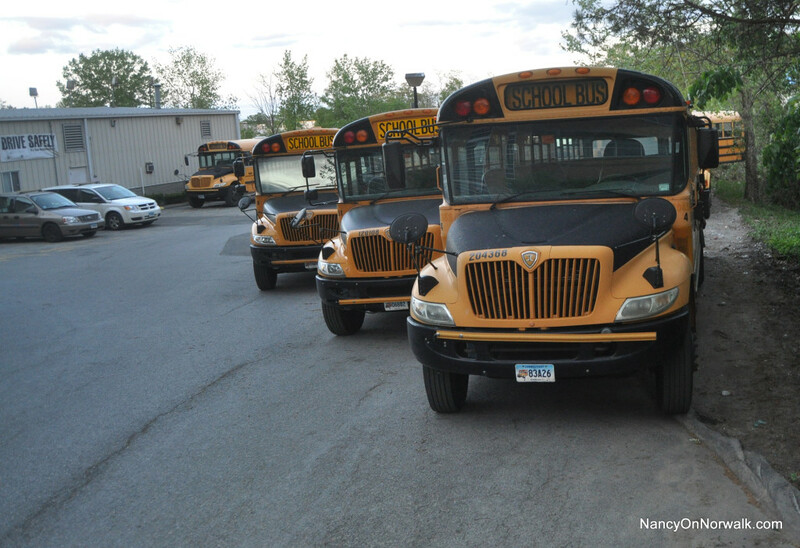 NORWALK, Conn. – Norwalk school buses have been moved across the street from the bus depot created by the Board of Education and the City just one year ago, according to BoE Chairman Mike Barbis. NPS and the City of Norwalk were not aware that Eversource has an easement for a high voltage underground transmission line at 332-334 Wilson Ave., the site of the new school bus yard, Barbis said at last week’s BoE meeting. Eversource plans 25 days of work to replace its underground facilities and notified the City two weeks ahead of its planned start date, resulting in contentious negotiations, Norwalk Public Schools Chief Financial Officer Thomas Hamilton wrote in a memo, explaining the reasons for an agreement that the Common Council will consider Tuesday. Eversource has already begun the work, Assistant Corporation Counsel Darin Callahan wrote in a Nov. 15 memo to the Council. The Council in September 2017 authorized a 25-year contract to lease the Wilson Avenue bus yard from Stanley Seligson, Hamilton at the time said the lease would save the district $56,860 in its first year, and over the course of 20 years could save $7.5 million. The City leases the property and then subleases it to First Student. Eversource owns 319 Wilson Ave., where the buses are being stored, and will reimburse First Student for reasonable expenses, Callahan wrote. The company is working to submerge a transmission line under the Norwalk River in connection to the Connecticut Department of Transportation’s Walk Bridge project; Poirot said the Ely Avenue work is unrelated. Eversource began its work on Nov. 3 and the agreement will be backdated, Callahan wrote. “Because we were able to agree on some basic terms, including indemnification language, Mr. Callahan agreed to allow Eversource to enter 334 Property for purposes of the Project provided that, the final agreement(s) were back dated to the date work was commenced (November 3, 2018) to cover risk arising while the parties negotiated the terms of the agreement,” Hamilton wrote. The agreement holds Eversource accountable for hazardous wastes, absolves Norwalk of any liability for damaged or stolen equipment and requires Eversource to have liability insurance. Eversource installed the fence and put in gravel, and is paying for security, the agreement states. Work on underground cables, associated duct banks and splice vaults is expected to continue to Dec. 23, Callahan wrote. Think Barbis knows about the gas contamination on the bus lot? Or the fact the busses sit now on a pcb remediation site not signed off by the deep where transformers and soil have been taken, leaving a crush stone bed to vent the soil? Now with a new fence who would think to ask if thats a brownfield. The city should ask cruiser sits on crushed stone with the window open bright move if Im right. The concern at the time was the underground contamination where this lot was rented and who was on the hook to clean up anything showing up in the tests wells on the property. Behind the bus in Nancy’s picture sits s fuel tank farm with pumps almost in the wetlands just ask Village creek assoc. .
“Eversource is in the process of conducting major maintenance on its electrical infrastructure throughout the City of Norwalk,” Why? Manressa is a hub all major power lines in Ct end or start at Manressa. I thought there would be a power line going down South Main from the police station I didn’t know Meadow st was connected. So if they are digging up the depot where is the environmental report on the contamination on site, start digging that up and of course cold weather is when you want to dig preventing any runnoff into Village Creek the river. Where are Norwalks team to handle things like this? Time for some facts this is right on the water table and all the problems on both sites have never been talked about. Just another reason the shellfish water and harbor commission should be sitting at the table , city hall is not set up to even ask questions at this point. This is another City mistake. The Fuel depot is a problem. The land is contaminated and the easement from Manressa connects to Ely Ave. They need to remediate in winter when its frozen. the leased a contaminated lot. Village Creek should have cared about this. They cleaned out a zone down stream and paid for the salt march restoration. The Harbor Commission, the Water Quality and shellfish Commission should BE ALL OVER THIS. Duff and Eversource are doing whatever they want with total disregard for health and Safety. The City waisted $100,000 on a Manressa study but they don’t own it. Eversource has plans. Eversource put a fence around Manressa they don’t have to do anything. They can’t sell without cleaning it up. PCBs were used to cool the lines (115,000 volts each); the fluids kept the lines from overheating. Two more Brown Fields. This is one disaster after the next. No one in City Hall has a clue about these concerns.